Mililani's Makani Duhaylonsod shut down Campbell last night in the OIA Red championship. Three years into her Trojans career, the wind finally blew Makani Duhaylonsod's way. The junior hurler scattered six hits and belted a solo home run as Mililani topped Campbell 4-2 last night to capture the Oahu Interscholastic Association Red Conference softball championship. As OIA champion, Mililani secured an opening-round bye in the Data House/HHSAA State Softball Championships, which begin on Jan. 31. A crowd of about 200 at Central Oahu Regional Park braved chilly conditions to see Mililani capture its first OIA title since 2002, and its first under second-year head coach Rose Antonio. It is the school's sixth league crown, with the first five under former coach Mike Okimoto. "I wasn't around for the first (OIA) championship. Campbell is really solid with good players," said Duhaylonsod, who struck out six and walked just one. "We played our hearts out." "I love our defense," Duhaylonsod added. "I feel great," Antonio said. "I'm very proud of these kids. You know what? Campbell is physically strong and well-coached. On a different day, anything can happen." Campbell coach David Perreira praised the Trojans. "Makani was on it. She was throwing harder today, with the adrenaline pumping," he said. "They have been here, done it before. For us, these are uncharted waters. We'll keep our heads up. We're still the (OIA Red) West champs, and states is what we want." The Trojans jumped to a quick lead when freshman Courtney Senas jacked a line-drive solo shot over the fence in right-center. "I think it was down the middle," Senas said of the 1-0 pitch. That gave Duhaylonsod, a 5-foot-11 junior, a boost before she took the mound. After losing twice to Campbell during the tough OIA Red West slate, she had a different approach. "My insides were working. We knew they ripped the outsides before," Duhaylonsod said of her pitch location. After taking an early lead, the Trojans got another run in the top of the third inning when Kristi Oshiro singled, stole second and went to third on a sacrifice bunt by Celina Garces. Senas then sent a chopper to left, bringing home Oshiro for a 2-0 lead. The Sabers answered in the bottom of the third. Juraishalei Murray-Thornton, the defensive hero in Campbell's semifinal victory over Kailua, sat on a hanging changeup from Duhaylonsod and smacked it over the left-field fence. That brought the Sabers within 2-1. 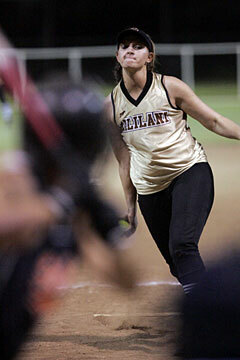 Mililani manufactured a single run in the fifth when Oshiro was hit by a Breanne Patton pitch. She stole second, went to third on another Garces sacrifice bunt, and came home when the throw to first went awry. That gave the Trojans a 3-1 lead. Duhaylonsod, struggling at the plate, led off the sixth by hammering Patton's first pitch high and deep to center, well over the fence for Mililani's fourth run. In the bottom of the sixth, Duhaylonsod issued her first walk and was in some trouble. With two runners on, Patton was at the plate with a 3-0 count. She wound up lining out to second to help Mililani get out of the inning unscathed. The Sabers got an RBI single from Gerika Pantohan in the bottom of the seventh, scoring Brittney Garcia. However, Duhaylonsod got Amber Kaulia to ground into a fielder's choice, then struck out Murray-Thornton to end the game. Campbell was seeking its first league title since 1992, when Loke Huddy was coach. The Sabers won the first-ever softball championship in '77, also under Huddy. Makani Duhaylonsod and Skye Virtudes. Breanne Patton (6), Leina Kalua and Anuhea Yamaguchi. Leading hitters--Mililani: Kristi Oshiro 1-3, 2 runs, 2 stolen bases; Courtney Senas 2-4, HR, 2 RBIs; Duhaylonsod 1-3, HR, RBI. Campbell: Samantha Palipti 2-3; Juraishalei Murray-Thornton 1-3, HR, RBI.